Welcome to the new Magic Cooking Products web site. To our hundreds of returning customers, we hope you enjoy our “new look” and the enhanced features of the new web-site and if you are a new customer we look forward to making your cooking experiences just that little bit easier. 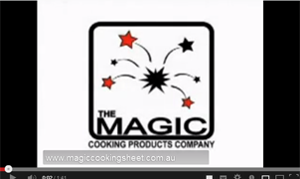 Magic Cooking Products are proud of their range of quality re-useable liners, from the cooking sheet to the bakers pack, we know that you will enjoy using our products and save so much valuable time that used to be spent cleaning cooking pans and BBQ hot plates. Easy to clean, wash in hot soapy water or place on the top shelf of your dishwasher. Oven - Line your baking pans and roasting dishes – all you wash is your Magic Cooking Sheet. Line the base of your oven with our Magic Oven Liner – when spills happen – just wash the oven liner – no more scrubbing the base of your oven. Microwave - Cut the Magic Cooking Sheet to the size of your carousel.Just wash when required. Grill - Grilling is easy – just place the Magic Cooking Sheet on the top of the rack on the base of the tray – saves hours of scrubbing. Health Grill - Cut 2 pieces of the Magic Cooking Sheet to fit your appliance – one piece is used to line the base and the other is used on top of the food before closing the lid to cook. All you clean are the 2 sheets not the appliance.